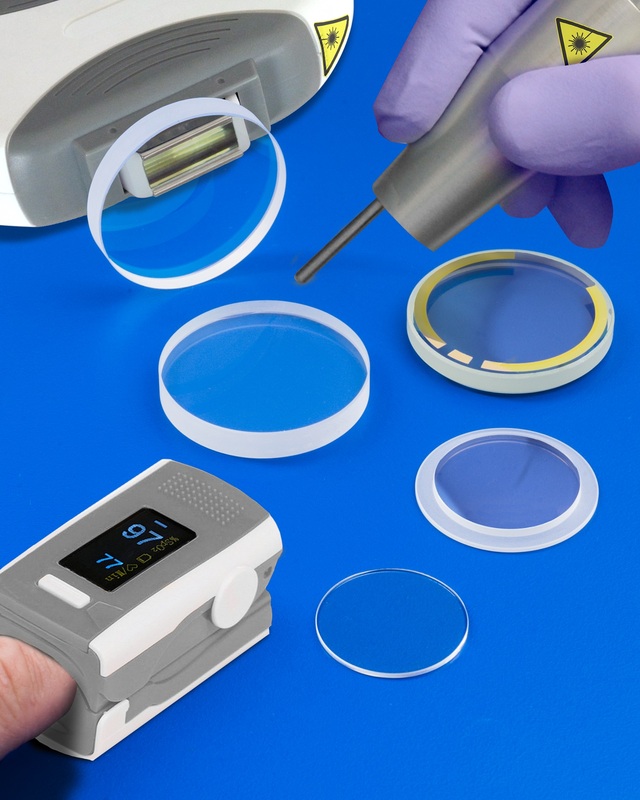 Custom sapphire optics for integration into medical instruments that come in frequent contact with the skin, blood, medications, cleaners, and other harsh chemicals are available from Meller Optics, Inc. of Providence, Rhode Island. Meller Sapphire Medical Optics are ideally suited for use in high-value medical and laboratory instruments because of the inherent durability of sapphire, which features Moh 9 hardness; second only to diamond. Impervious to harsh chemicals, chlorine and fluorine gas, and blood, these clear and durable sapphire optics transmit from the UV to 4.7 microns. Manufactured in 1/4” to 10” dia. sizes; round or square, concave or convex, and flat or stepped, to precise OEM specifications, Meller Sapphire Medical Optics can be finished with holes, edge treatments, and coatings to enhance transmission to > 99%, depending upon thickness. Flatness can be held to 1/10th wave, parallelism to 2 arc-sec., and surface finishes to < 0.5 mm. Meller Sapphire Medical Optics are priced according to size, configuration, and quantity. Quotations are available upon request.